Sri Lanka’s gross domestic product (GDP) is likely to grow a further 7.0 percent by end-2016. Interestingly, the services sector contributes the lion’s share, 61 percent, to GDP. With strong growth in the services sector in the recent past, it has managed to create noticeable employment opportunities, helping public wages and salaries rise sharply. As per Sri Lanka’s Department of Census and Statistics (DCS), the estimated average household income per month at national level was Rs.45,878 in 2012/13 in Sri Lanka. Mean estimated household income increased by 25.9 percent from the previous survey year (2009/10) respectively. The rising number of high-net-worth individuals and other income segments resulted in a growing demand for housing. To fulfil the demand, developers continued acquiring land within the central and secondary sub-markets. Due to the limited availability of land in the city, select locations within the central and secondary sub-markets saw faster growth in land prices of around 7-8 percent on average annually. 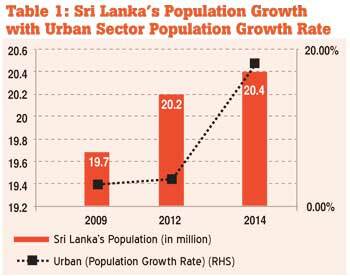 Hence, Colombo’s select current demographic conditions stress on unaffordable real estate to lower income group. Only the top 20 percent of income-earning households can afford to buy their dream homes in Colombo or its suburbs. Even the top 10 percent of households with a mean monthly income of around Rs.0.3 million can only afford a two-bedroom lower-mid property in a secondary location. Even in suburban locations, the top 10 percent of income-earning households may not be able to purchase a two-bedroom upper-mid apartment. Therefore, apartments in the Central sub-market and in upper-mid and luxury projects in the secondary sub-market have to rely on high-net-worth individual residents and foreigners. Limited income earners of Colombo are forced to opt for properties that are at least 20-25 kilometres away from the city limits. An affordable housing project should be located within reasonable distances from workplaces and should be connected adequately through public transport, since housing plus transportation costs will greatly affect affordability. According to Sri Lanka’s Urban Development Authority, in government promoted schemes, the number of affordable houses is going to double. Population migration from the rural areas to the city suburbs is expected to grow; however initiatives taken by the government may not be sufficient. Am fahim.at the moment am staying in a rental house.am a middle salary person.i like to buy a government house for monthly payment.i have three kids in school age .also there studying in government school in Colombo.please be kind enough to give me a house under monthly payment. i’ll like to buy a house on monthly installment payments now im living in a rental house and i’m a middle salary preson so please be kind enough to give me a house.